I felt bad today about the passing of Julius Rudel, and so I am breaking my Web log silence. Once I wrote about my interview with Maestro Rudel a long time ago in which I was something of, ahem, a ditz. Hahaha... I see I wrote that I demonstrated my familiarity with Hans Knappertsbusch, this Old World conductor, and that was what got me out of the doghouse. I remember exactly what happened. 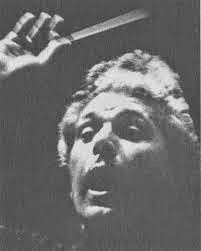 What happened was, I asked Julius Rudel which conductors he admired growing up. And because I had made this ditzy mistake about Gregor Piatigorsky, which I would never make now thanks to Leonard Pennario, Rudel took it slow. He said that there was one conductor he especially liked. And he said, "I'll spell it for you." Because I was this ditz. I sat there, taking my lumps. Rudel goes: "K-n-a-"
And I said: "Oh, Hans Knappertsbusch!" That was what got me out of the doghouse. After that the conversation was back to normal. It just happened I had a record by Hans Knappertsbusch when I was a teenager. And when I was talking with Rudel, it was as if my 14-year-old self were tapping me on the shoulder. "Pssst. Hans Knappertsbusch." I wrote about Julius Rudel today in The Buffalo News. I hope it worked out OK because I wrote it fast and I was feeling sad. I hate losing these old people. I hate losing our old music directors. And Rudel was so gracious, so gentlemanly. My parents rejoiced when he was appointed music director of the Buffalo Philharmonic Orchestra. I remember them gloating and dancing around. They loved Rudel and his Mozart and his Haydn.